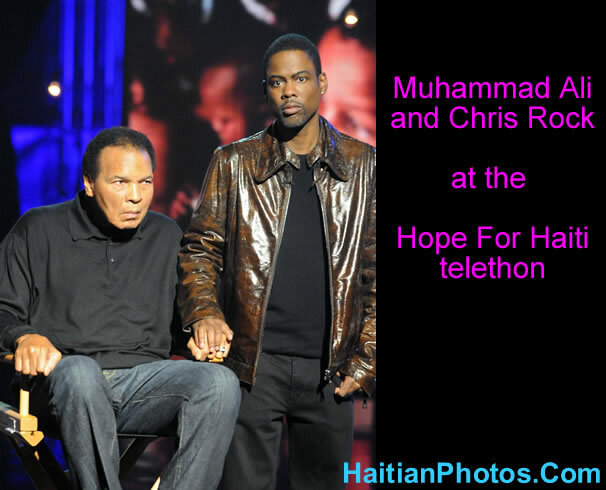 Here is a picture of Muhammad Ali and Chris Rock participating in the Hope For Haiti telethon. Hope For Haiti Now: A Global Benefit For Earthquake Relief was a charity celebrity telethon held on January 22, 2010 from 8 p.m. to 10 p.m (E.S.T). Muhammad Ali, one of the most significant and celebrated sports figures of the 20th century took part in this live program on January 22, 2010 from Los Angeles, California. There he appeared with actor, director, comedian, Chris Rock who read a 2-minute message of this great boxer. One week later, Muhammad Ali again appeared with multi-Grammy Award winner, Christina Aguilera; they teamed up to raise money for the United Nations World Food Program (WFP) Haiti relief efforts by appearing in a Public Service Announcement underwritten by the Yum! Brands Foundation.